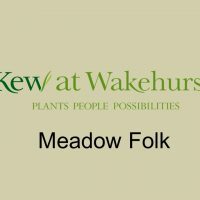 This practical, field based training day looked at the range of meadows at Wakehurst Place which have been developed over a number of years using a variety of techniques. The 26 attendees, from 13 different gardens including historic, botanic and wildlife gardens, came with a range of meadow management experience from novice to those who are in the process of managing and restoring meadows. Iain Parkinson, Conservation and Woodlands Manager at Wakehurst Place led the day and shared his experiences and learning through trial and error. Attendees were introduced to the range of meadow initiatives, seed collecting and storage, and the tour included the seed drying and storage area, machinery and the nursery plots. I thought the whole day was fantastic and really beneficial for me. I took away lots of ideas for developing our own grasslands in the future. Good balance of classroom based work and out in the field – a nice heavy weighting towards being outside! I like it! Excellent day and a big thank you to RBG Wakehurst and especially to Iain for his amusing, honest and down to earth approach, loved it.